Amid many possible areas of exploration I considered for my residency at the Gardner Museum, I decided to see if I can bring more mindfulness to my own thinking about families in museums. Through my research and evaluation on families in many types of museums and my experience taking my granddaughters (currently 6 & 7 years old) to museums, I have been struck by what Ellen Langer refers to as “mindless” practice. It’s when we keep doing the same thing over and over without questioning the underlying pedagogy or assumptions. We stop paying attention and go on autopilot. Nothing very interesting can happen in that place. I know that there are increasing examples of innovative and thoughtful work by museum educators in the area of family programs and I encourage you to share those ideas with us here. Yet over the years of both watching and participating in family museum programs three key questions keep emerging for me. Where is the family in family programs? Figure 1: I did this awkward little drawing as a composite memory of many family programs in different museums. While this is from my experience, try a Google image search for “family programs in art museums” and you will find, amidst lots of pictures of kids making art, some images that have this same basic choreography. Yes, the odd tilt of the painting bothers me too. A host of questions emerge for me that I would love some e-conversation about: Why do we repeat this model over and over again? Does our training push us towards a developmental model where we know only how to program towards children or adults, but not both at the same time? Is the skill of encouraging parent child engagement one that is better fostered through other disciplines and thus should we be looking at best practices in other disciplines such as social work or psychology? Why do we use a school model of discussion and interaction in family programs? I’ve watched many well-meaning facilitators sit or stand in front of a work of art and make eye contact with the children almost exclusively. Not only does this tell parents to stand back but children quickly figure out that they are supposed to look at the facilitator and most of them conform. Children are asked questions and they raise their hand to answer, just like in school. Families tend to have fluid conversations, a lot of give and take, and while we might remind a child to not interrupt we rarely ask our children to raise their hands when having a conversation around the family dinner table. Why then do we default to the school model in the museum experience? Even more frustrating is that this school model draws attention away from the objects and instead focuses attention on the educator. I’ve taken time-lapse photos and the average time spent looking at the art when sitting in this configuration is about 2-3 seconds – total, unless of course a child is not paying attention to the facilitator and looks at the art anyway. How does the experience leverage the uniqueness of the museum? The most important issue for me is that too many of the activities we offer in family programs don’t maximize the value of what the museum has to offer. Engaging people of all ages in hands-on activities in the galleries can be a wonderful way to guide them into a deeper appreciation of the artwork. Yet, I’m concerned because too often the activities don’t connect very well with the artwork or the way the artist worked. I keep asking, “Why is this activity happening in the museum?” Most of what I see could be done anywhere and, sometimes, would be more effective without the visual distraction and noise of the gallery. I wonder, do we continue to under-maximize the uniqueness of the museum because we aren’t clear on what that is? Or do we operate on the assumption that families aren’t able to grasp it? What will be my focus at the Gardner Museum this summer? Figure 2: Sam Bates a.k.a. 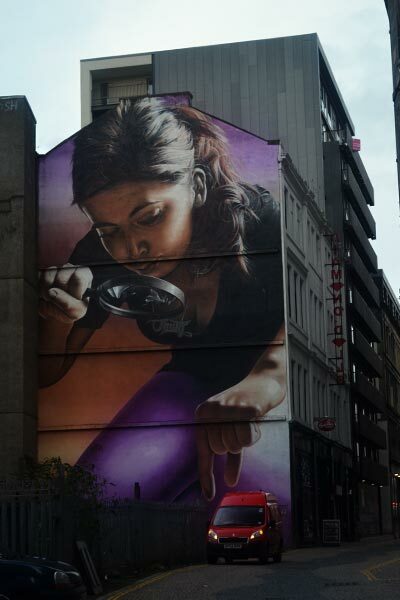 Smug, Girl with Magnifying Glass, Glasgow, Scotland. As I continued to think about these issues I realized I was focusing only on how the educators planned and implemented programs. I began to wonder if I, too, have gone on autopilot. I know what kind of family experiences I’d like to see in the museum but, as I frequently warn my colleagues, using ourselves as a representative for the general visitor is not very smart. So, during the month of July I’ve invited families to come to the Gardner and allow me to accompany them. I won’t have an agenda, lesson plan, protocol, notebook, or audio recorder and I plan to allow both the “educator me” and “evaluator me” to recede to the background. I want to explore facilitating “with” families rather than “for” them. I want to pay more attention to invisible pedagogies – both how the physical space itself instructs and how actions from people (me included) communicate behaviors and attitudes. I will invite the families to begin where they want to. I will have a few things with me, such as a flashlight for dark corners, some sketching materials, and magnifying glasses but I may not ever pull them out. I’m imagining, for instance, that as conversations evolve the need for things like that magnifying glass will naturally arise and I will, much like Mary Poppins, slide it out and hand it to the adults so they can facilitate the experience for their family. Admittedly I’ve had moments of near panic just thinking about the unstructured quality of this experience. I have no idea what will happen and have to trust that if I stay mindful, sensitive, and observant that I will notice new things and be filled with wonder. I’ve invited local museum educators to come hang out with me. They can’t bring notebooks either and they have to agree to talk with me afterwards and write up a reflection of their experience. The family visits begin on Wednesday, July 9. Meanwhile, I invite your comments. I hope I’ve raised some hackles one way or the other. If everyone is nodding in gentle agreement then I haven’t pushed enough buttons. MARIANNA ADAMS is President of Audience Focus Inc. 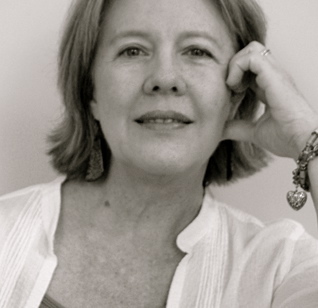 Her professional roots began in K-12 public and private school teaching (fine art, English literature, social studies, and special education) and segued into museum education where she headed several education departments in Florida museums. She founded Audience Focus Inc., in 2007 after 12 years of conducting evaluation, research, professional development, grant proposal writing, and concept development for the Institute for Learning Innovation. Her degrees are from George Washington University (Ed.D. ), University of South Florida (M.A.) and Mercer University (B.A.). In her spare time she is an avid yoga practitioner and teacher. HI there. these posts are always so incredibly topical! I am an art educator in new zealand, and have just finished training where a colleague presented on ‘creating a positive learning environment’ in our schools programmes. (A personal inquiry of hers), and in this we talked about the role of parents, how to engage them, and consequently make a positive learning environment for them as well as their children. we are going to consciously include parents in our introductions to our sessions, get them helping groups with activities, and find other ways for them to feel included. But we have so much more to do in this area so i would love to hear other peoples strategies. i am guilty of feeling under time pressure in a one hour programmes, and can race into the children’s points of view, without stopping to set up clear, transparent expectations and structures so everyone knows their roles. your other points about meaningful activities is excellent.In schools programmes, games that families can use independently, any family drop in art making that galleries run, should be making peoples connections with the artworks stronger, and increasing their accessibility to any visitors, regardless of prior knowledge. I definitely understand about the time pressure issue. Museum educators often feel so rushed with an over-large to-do list. This usually transfers to the programs as well. It’s so challenging to create an uncrushed learning experience when you know there is a definite time boundary but it’s worth continual exploration. One of the things that museum visitors and teachers in museum professional development sessions remark as being valuable and memorable is not feeling rushed. So we owe it to them and to ourselves to work on that. I’m happy to hear that you are working to “consciously include parents.” It seems so obvious but I’m perplexed by how often we don’t invite the adults. Also loved your reflection on the importance of setting clear expectations. In general, I’d say a theme I took from your comment was that we all need to just slow down. It’s definitely something I have to practice, over and over and over. Maybe I’ll get the hang of it eventually. Thank you for sharing your experience. I have recently completed some similar action research focusing on young adults rather than families and felt the same apprehension before starting. In the end it was a rich experience that raised many questions I could not have foreseen. For this reason alone it is worth doing. So happy to have a fellow traveler in the journey of not knowing. It’s scarier than it sounds. Our early childhood programs are based on a Parents as Teachers model and this has carried over to our family programming. In other words, the family unit is working together, and we are role models on how to engage in the museum. Another component of the ARTSmart programs includes workshops that have a split component to start – a track for adults and a track for kids, and then the two groups come together. By far our most popular family events are workshop that include a gallery activity designed to have the family work together, followed by makers space time workshops that everyone participates in. We have found that VTS, if we invited everyone to participate, works very well! Thanks for sharing these ideas. I would love to know more about how you role model the social group working together. It’s so important to walk our talk. Like children, museum visitors tend to do as we do, rather than what we say. The split track idea is fascinating and look forward to learning more about it. Thanks for the link. It’s quite interesting and comments from readers even more illuminating. Bravo for starting at the beginning – umm, what do you really mean by family! The answers tell so much about how we think about an issue. it also helps everyone get on the same page so that when someone says something like “family,” the group members understand the same thing. I love this project and this post! At The Noguchi Museum, we tried very hard to engage the full family in family programs. We found that often adults did not want to participate other than as caregivers: their expectations for family programs at museums were that these programs are for kids, and they wanted to watch their kids enjoying the activities. Which was so different than my own feelings about attending family programs as a parent. I look forward to hearing about what you learn from families, as you accompany them through the museum. I know what you mean. I’ve seen that too. That’s one reason why I’m just being with families. Maybe my bias is to the all-in model and that’s not what some families want. Maybe for them what they want is a kids programs where adults have to stay with them. I do find that the pleasure many parents get is from watching their kids. As is the case with most of life, one size does not fit all. Something else occurred to me. I see a lot of what you are describing in school programs. We want teachers to engage and participate. While some of them do, many stay in the background. They either catch up on paperwork at their desk if it’s a classroom visit or they look at art on their own, enjoying listening to the museum guide. Much like parents, they usually stay with the children and monitor any behavior issues but stand back. Many say they want the children to interact with other adults as student often tune out the teacher after a while. They also like to watch how the children interact in that situation, saying they learn a lot about how to motivate some who are difficult to motivate. Some are just exhausted and appreciate a small break. Maybe it all comes down to our intentions and how clearly we communicate them on the visible and invisible level. I’m thinking that Katherine’s split track (see her post from the Beach Museum of Art above) is an interesting way to walk both those lines. The parents get some time for themselves knowing the kids are well taken care of and they get to have some family time too. I wish I could observe some of her programs. What fun to get an update about your continued work on this topic after you so generously helped me with my thesis at UArts on adult engagement in family spaces. The point Rebecca raises here, that some adults intentionally want to observe their children in these environments, is right in line with what my research found. Adult visitors who come with their families to museums are a diverse audience group, who don’t all have the same expectations and goals for their visit. I’m working now on a proposal to participate in an AAM panel session for next year on just this topic. I look forward to following your work at the Gardner. Good luck, and I hope you can post a follow up here at the end of the summer. 1st, is it the role of a museum to educate? Perhaps it’s about the collection and study/research into Fine Art, and the artist’s intention had no brief for producing an object for education at all? That said, I took a group of Tertiary Fine Art students to the Sydney Holocaust Museum, where a survivor facilitated the visit — very powerful experience for all. The exhibit that really made the difference was a spotlit pile of CHILDRENS’ SHOES — this was the FAMILY LINK that hit everyone, with it’s powerful, poignant, silent eloquence. You may call this a form of installation, however ART was not the intention, nevertheless, this object (as a whole) had a terrible beauty I’ve never seen equalled in an Art Museum. I wonder on your behalf what families would have made of this direct call to anyone’s childhood! I think most art museums and maybe I’ll even go so far as to say most any kind of museum has in it’s mission statement something about educate, or some synonym of it. Not sure about other parts of the world. So whether or not an artist had the intention to educate, whatever they mean by that term, seems to be trumped by the museum’s mission statement. Re the shoes: The National Holocaust Museum in DC has a similar display of all types of shoes – adults and children that is equally powerful. I haven’t observed families there. When I went I was so wrapped up in my own experience it was one of the rare times in museums where I didn’t watch visitors. Ian’s comment about “educate” is an interesting one, and I remember a time when museums struggled with how to define/redefine the public mission. What one word could we use that encompassed the variety of interactions we hoped to have ? Going back to Marianna’s post, it makes including everyone in the program even more challenging, because different age levels mean different types of experiences! Here is our current solution! The Marianna Kistler Beach Museum of Art furthers the teaching, research, and service missions of Kansas State University by collecting, studying, caring for, and presenting the visual art of Kansas and the region. The Museum’s exhibitions and programs expand its collecting focus by connecting regional art, culture, and interests with the larger world. The regional art in our collections — as well as art generally — provides a rich terrain for discussion across disciplines. We present encounters with art as opportunities for exploring human experience. Individuals think anew about personal experiences, sense of place, and the world of knowledge. Mindfulness is technical jargon for, a ,C.B.T,-(Cognitive Based Therapy),in Clinical Psychology . it is an controversial treatment in scientific research terms. How do you justify ?,applying this term to museum practice? Thanks in anticipation ,BTW no criticism intended or implied !. I am not familiar with Mindfulness Based Cognitive Therapy other than the few minutes I just spent scanning it on Google. I was using the term, mindfulness, in a very general way, as in we need to be mindful, thoughtful, conscious in what we do in our personal and professional lives. I have practiced mindfulness meditation in the Buddhist tradition (but not an adept at it by any means) so I suppose I’m influenced somewhat by that tradition. 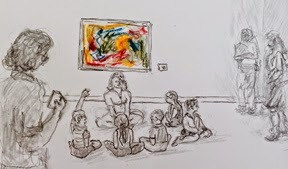 As far as why I am justified in using the term mindfulness in terms of museum practice, I suppose my experience with mindfulness meditation is about bringing the practice into everything you do in life so my work is something I do. But more importantly I don’t spend time worrying about whether or not I’m justified in synthesizing ideas from different disciplines. I think the more we get out of our silos and play around with ideas the better. Ms. Adams, I’ve really loved reading this post. My experience in public programming has been both as an interpreter and visiting museums with my parents as a child. You’re right: family programming is an activity for kids that the parents need to supervise. As an interpreter, I feel as though this kind of set up can actually be counterproductive. When space has been made for parents to sit alongside their children, I’ve regularly seen them remove the activity from their kids’ hands to improve on it. I’m certain that this is the opposite of the collaborative learning experience that we’re trying to facilitate. I think that your idea to accompany families as they visit museums is fantastic. You’ve developed a way in which you can act as a responsive tool – a facilitator of their experience. I’ve been trying to think of other things you can carry with you to help… I’m wondering if something like an iPad with an encyclopedia app on it, for instance. This way, if questions are asked to which answers aren’t known and no interpretors are present, you can facilitate a shared learning experience? Interesting ideas. I’ll think about the iPad, particularly if I don’t have a Gardner educator accompanying me. So far, I’ve had “walking” encyclopedias in the form of staff. I will also need to see if the wireless works well there. I don’t want my stuff to draw their attention away from what interested them in the first place. The room guides in the galleries explain almost everything or at least identify it. Re: the parents who take things away from kids to do it themselves. Yes, I’ve seen this but in my experience it’s the exception rather than the rule. This may be different in other parts of the country or world though. Most parents tend to turn the experience over to the museum facilitators either because it’s what the parents want or because they think that’s what they are supposed to do. We tend to remember those few parents who co-opt the experience from the child more than we remember the other types of family interactions. As I understand it, research suggests that we are hardwired to remember the negative over the positive and we have to practice balancing that out. Marianna, thank you for this great post. It’s giving me yet another excuse to come to Boston in the next few weeks and lots to think about as we transform family programs at the Met. Thank you! Marianna, this conversation reminds me of Ben Garcia’s wonderful article for the Journal of Museum Education, http://museumeducation.info/wp-content/uploads/2012/06/jme.v37.n2.FREE.pdf in which he calls for us to stop thinking about copying or even addressing the formal classrooms in schools and start focusing on what we do best: informal learning that has so many advantages over the school model. Unfortunately it’s the most common learning model we have, so practicing new models isn’t second nature. Thank goodness you’re thinking about these things during the wonderful opportunity your residence presents. Thank you! Marianna, I’m captivated. I think you’ve set yourself and us up to learn a lot. I can’t think of anything more challenging and worthy than being present with whatever is happening. I can see many down dogs and sun salutations in preparation for a stillness that brings forth a presence to just be and see while in the galleries. I’m especially intrigued about the invite for a whole family experience. I recall working with families (with older children) while teaching in the museum and inviting interpretative response to a work through a question (carefully crafted for openness and one that works with the selected artwork) to be answered either in writing or out loud (both shared communally). Here’s what I noticed: when I set the activity up by passing out pencils and index cards to everyone for writing, adults and teachers say no, “Why, no thanks.” (I think they’re used to viewing that time as passive.) However, when I say we’re all playing this time and they do participate, the sharing unfolds with richness. Insights about the art, life, difference, similarity, and living in the world appear. Closeness and connection come forefront. I’ve noticed that my task is less about teaching and more about subordinating teaching to learning, and knowing the nuance of engaging that. Here’s my thought: It’s hard to get to those insights. It’s hard, I think, because the leader needs skills based on inter and intra-personal intelligence (self-knowlege, knowledge about others). And enough confidence to go quiet (in voice and inner being) to listen and see. Marianna, Thank you for your post. The intergenerational nature of family programs and activities is something we have been thinking about for the last few years at Carnegie Museum of Art. Our drop-in program for family visitors is called ARTventures and we are fortunate to have a staff of friendly and enthusiastic museum educators to facilitate the activities. One of the first things we ask family groups as they get started with the activities is, “Who is on your ARTventures team today?” This question helps us to prepare family visitors for the rest of their ARTventures experience, which we intend to be intergenerational, requiring the participation of all family “team” members. As visitors explore the galleries, ARTventures staff are stationed in different gallery spaces with activities that directly relate to a work (or a group of works) of art. The staff provide a brief introduction of our game-like activities and give each family “team” member a role. Some of our game-like activities include prompts for discussion, drawing activities, materials explorations, and kinetic activities, for example. Our hope is that, through our ARTventures activities, we’re providing families with “tools-to-go” — activities that they can enjoy in CMOA’s galleries and then repeat in other museum or gallery settings on their own. This means that they are not complex activities, they don’t require special equipment beyond paper, pencil, and their imaginations (we have specially designed activity cards that they can take home, as well). Similarly to what you describe, our hope is that each family group and individual family member can have meaningful experiences (or should I say individual meaning-making experiences) in front of original artworks, avoiding the pitfall that you describe wherein the parents act as coat holders while the kids have all of the fun. I would be happy to provide more specific examples of our current and past ARTventures activities. Please feel free to get in touch and best of luck with your research! Can’t wait to read about the outcome. These are great ideas. The educators at the American Natural History Museum in NYC told me that when the prepare the adults (parents, grandparents, extended family) for their role in a program and frequently refer to those roles throughout the program that they get a lot more whole-group involvement. It’s the same thing Susan said above, that we have to invite the adults to play. I love the idea of having staff stationed in the galleries during the program. This provides families with the choice and control that they need. (I reflect more on this in my next blog.) People love having a real live person to interact with at the museum, they just don’t want to feel trapped in someone else’s experience. Bravo. Marianna, thanks very much for this post and for starting a dialogue about family programs. I’m really looking forward to hearing about what you learned at the end of the summer. We started off the series with a family program called “How to Talk about Art,” which was essentially a tour about tours so that parents could see our educator modeling how to talk about art, and then parents could walk away with a framework for discussing works of art at any museum in the future. We received some very valuable feedback and gained a lot of food for thought from this experiment. Because we had such an expert facilitator, kids and families both felt comfortable sharing their thoughts about the work–even when there were two different set-ups. At the first stop, kids and grown-ups stood in one big circle around the work of art; and at the second stop, many of the kids stood in front of the parents. In both cases, the comments were insightful and I think that both parents and kids learned from one another–not just about the artworks, but about how each thought about art. In a survey completed by a kid afterwards, she said that she liked hearing from the adults because they always notice things that kids don’t. One of the comments from the adults was that she or he never would have stopped to look closely at the works of art that the educator selected. While there are certainly a few tweaks that we will implement the next time we do this program in August, particularly in terms of empowering the parents to do what the educator modeled, I think this program was successful and has a lot of amazing potential for a multi-generational program in which each generation is gaining something valuable from engaging with art. I’m happy to share what we discover after we implement three different experiments in family programs this summer. I’m looking forward to seeing what these experiments will teach us and am excited that other museums are similarly experimenting! Thanks for sharing these ideas. I’m ready to put my grandchildren on a plane and come to your family programs. They sound great. I would be most interested in your reflections after you implement your experiments and BRAVO for experimenting. We have to be willing to do this, to play a lot more with programs and approaches. Otherwise we all run the risk of getting stuck. I encourage you to write up your discoveries as a blog post and submit it to Mike for posting on this site. see the Sydney(Australia) Museum of Contemporary Art for their programs (in what is, surely ,one of the most beautiful sites in the world,excepting MONA in Hobart ,Tasmania of course!. The ART GALLERY of NSW (Also Sydney) has lots of integrated programs for Kids. Your blog is quite insightful. I agree that we often assume we are just in it for the children, we collaborate with them because we think it’s good for them. What my wanderings with families at the Gardner this summer re-emphasized for me is that I learned so much just by hanging out with visitors of all ages. Many times the adults (parent, aunt, grandmother) would remark about how something one of the children said or did caused them to see or think in a totally different way. Marianna, Perhaps your eloquent summary of my post can also apply to visitors in general. Ie Museums often think about their work in terms of what they can do FOR visitors. This is, of course, wonderful. However, I wonder if it would also be valuable to think about what museums can do WITH visitors for them and the rest of the community? Absolutely. Stephen Weil wrote an article in the mid-1990s titled something like: On being FOR someone rather than just ABOUT something. In the 90s that was where the museum was struggling to get. The field has certainly made some progress there and now it seems the shift is definitely towards the WITH.